| Nagada II ships : Funerary symbols ? 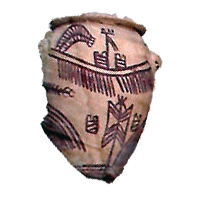 Nagada II ships : Funerary symbols ? Predynastic Gebelein mummies were discovered in the late nineteenth century by Wallis Budge, the British Museum Keeper for Egyptology, from shallow sand graves near Gebelein, about 40 km south of Thebes. 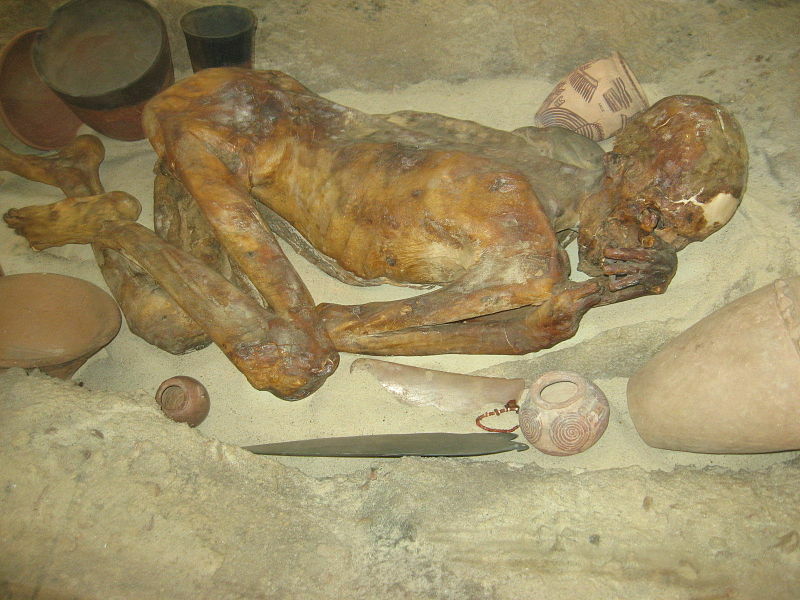 The six naturally mummified human bodies (men and women, young and old) are dated from Egyptian Predynastic period, approximately 3400 BC. 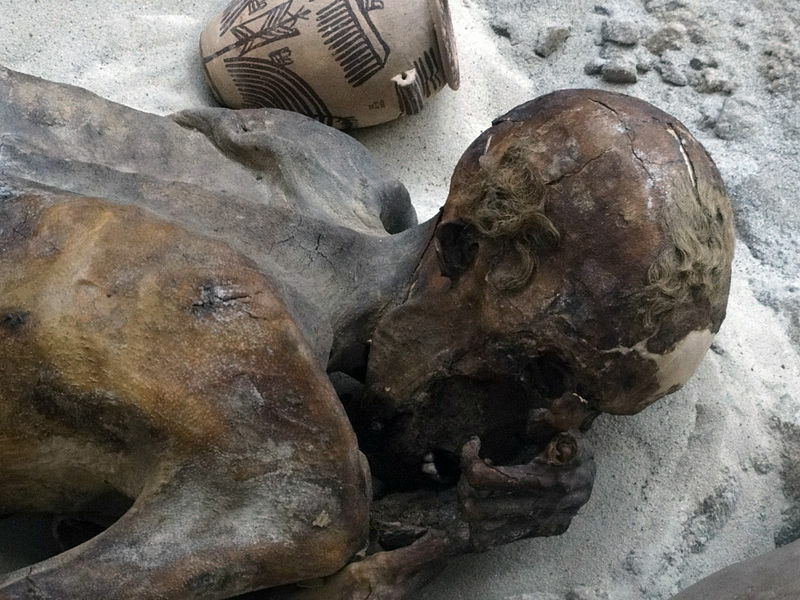 It is the oldest mummies found in Egypt. 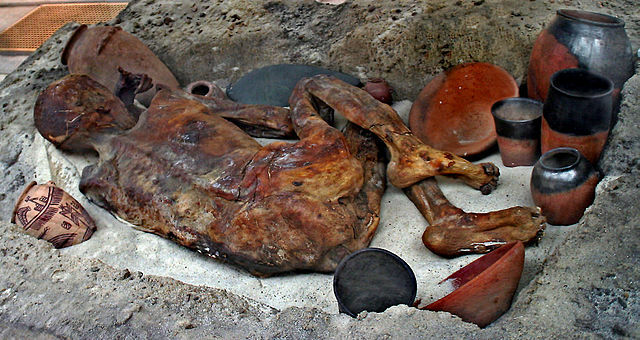 One of the body is accompanied by numerous pottery. 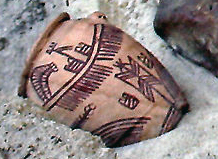 It is interesting to note that the theme of the ship is already on one of these pots. The ship is shown like in the engravings of the time. It is a long and thin platform on which are, in the center, 2 cabins, one of which is surmounted by a sign. Many oars are painted under the platform. At one end is a curved and very high structure not identified (sailing, canopy?). The drawing at the bottom could be the representation of a sail attached to a mast by 2 horizontal spars. Man EA 32751 mummy was aged twenty years and well muscled. The scan of the mummy shows an injury to the left shoulder that could be caused by a copper blade or flint knife at least 12 cm in length. The six bodies have fractures. They should have been murdered by surprise.